Wood, Vinyl, and Metal Fence. NOVA Residential and Commercial Fence Contractor Serving All of Northern Virginia For More Than 20 Years. We offer 0% down and 0% financing. Click for Details. My Fence Guys is the Fence Contractor to Call in Northern Virginia. My Fence Guys is committed to providing our customers with the highest quality fencing at a competitive price, within an acceptable time and with outstanding customer service. 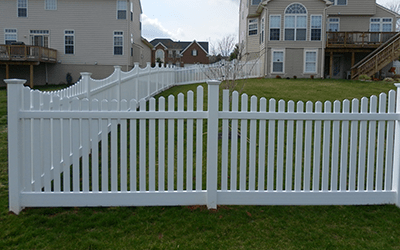 For more than 20 years My Fence Guys has been building beautiful new residential and commercial fences throughout Northern Virginia, with the highest attention to quality and customer service at a competitive cost that is hard to beat. Whether a commercial site in McLean or a residential property in Fairfax Station, we offer a wide selection of fencing from wood, vinyl, aluminum, ornamental iron and chain link that is sure to fit your needs. We feature many styles to choose from for residential and commercial customers in both urban and rural areas. We provide property owners in Northern Virginia with the lowest cost and highest quality service in the area. The classic beauty of wood fencing comes in a variety of forms and finishes that make it an ideal choice for homeowners and businesses alike. 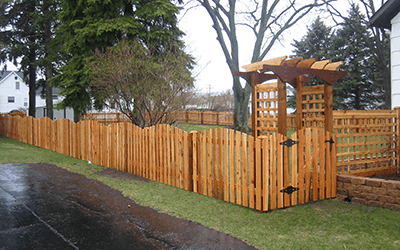 The three main benefits of using wood fencing are its aesthetic value, its privacy and its longevity. Vinyl fences provide a lasting beauty that is hard to match. The upfront costs of a vinyl fence are recovered because of the longevity and low maintenance. If you are looking for a classic fence with style and endurance, vinyl should be at the top of your list. 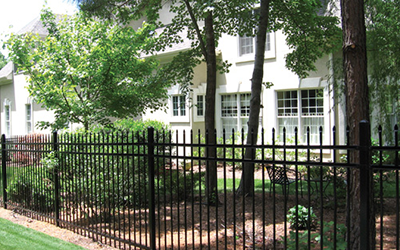 Whether you need to enclose a residential or commercial property, aluminum fencing is a low-profile option that blends well with its surroundings. It's strong, reliable and requires little maintenance. With many sizes, styles and colors to choose from, the appeal of aluminum is hard to beat. "Fantastic customer service. Our yard is odd shaped and on a crazy incline, but they were able to deal with all these difficulties and the fencing looks great and appropriate for area. They showed up on time, excellent workmanship, cleaned up, and we couldn't be happier. " "They did a good job. They came out when they said they were going to come out. They took a full day and they were done. They had to work until it was quite dark before they finished and they were determined that they were going to do it one day. The quality of the service was excellent." "Installation of chain link fence around property. I got a good fence at a good price. My brother also purchased a fence for his home. He got the chain link around the front and a cedar privacy fence around the backyard. They did a good job."